Everybody wants long and luscious eyelashes, but it seems impossible to get them without the help of mascara or other products. Some people are born with thicker eyelashes than others, but it still seems that the beauty industry has set the standard for thick, full lashes at a place that is simply too high for anybody to reach. Because of this, people often resort to chemical treatments or hair implants to achieve the appearance of fuller lashes. Instead, however, there are actually several natural substances that may be able to help you get the look of long, luscious lashes without all of the hassles. You’ve probably heard of coconut oil, especially considering that it might well be the most popular oil outside of olive oil. Somehow, coconut oil has managed to take the world, or at least the United States, by storm. It’s used for many different purposes ranging from cooking to nourishing hair. Coconut oil may be hyped up a lot in the media, but it’s worth all of the good press it has been receiving over the last several years. Coconut oil comes from the “meat” or fleshy part of the coconut. This “meat” can be considered as the “kernel” of the coconut. Coconuts grow from the coconut palm, which is a tree that many people have grown to love, and it can actually be considered a fruit, a nut, and a seed. Regardless of what you call it, it comes down to the same thing and has the same benefits. The oil is typically solid due to it having a melting point of 76 degrees Fahrenheit. It is often used in cooking and skin care practices due to its general stability and long-lasting shelf life. Its solidity may be due to how fatty the oil is. It’s considered to be a saturated “medium-chain” fatty acid because the fatty acids that it contains all have lengths that reach between six and twelve carbons long. With that chain length in mind, it’s important to know that most natural fats we tend to consume are all long-chain fatty acids. This makes coconut oil a very unique fat that can be a powerhouse of nutrients if utilized correctly. Overall, coconut oil has become so popular that many people have gotten used to it and have forgotten why it became so popular in the first place. It’s a very useful and beneficial oil that can be used in a variety of applications and for many different purposes. Out of all of the oils that are used in a claim for healthier and fuller lashes, coconut oil is the best by far. One problem that many people have with using oils on their lashes is that using such substances around the eyes is very risky. With that said, coconut oil is actually completely safe to be used both in and around the eyes, and it is actually commonly used as a natural treatment for conjunctivitis, which is more commonly known as pink eye. The worst thing that getting pure, organic, and unrefined coconut oil in your eyes will do to you is maybe makes your vision blurry for a minute or two. Other than that, it is completely harmless. With that said, it is important that you only use pure, organic, unrefined coconut oil for any health or beauty treatments, especially any treatment method that involves consumption or application around the eyes. Any additives in other versions of coconut oil may make it less safe for your body, so sticking to the natural oil is the best option. As with the application of other oils like castor oil, it seems that even just the thickness or viscosity of coconut oil can help give the illusion that a person’s lashes are thicker or fuller. Coconut oil is a great moisturizer and conditioner, which means that it can help each lash stand out, looking longer, fuller, and thicker against the other lashes. This means it can act as a natural replacement for mascara, and it can even be used on the eyebrows for similar results as well. When it comes to nutrition, coconut oil is the only oil, when compared to other oils such as mineral oil and sunflower oil, that can actually reduce the loss of protein when applied to the hair. Protein loss poses a great risk of damage to the hair, and also makes the hair look dull. When hair is full of healthy protein, however, it grows faster, thicker, and fuller. The fatty acids found in coconut oil have also been shown to be beneficial in protecting hair from breakage. So, if you are looking for long, lush and full eyelashes, you are probably wondering how to use your coconut oil to get the desired effect. There are several effective and simple methods. Try one or more and see which one works best for you. This home eyelash treatment is a great DIY treatment combining coconut oil with lemon and lavender oil. The coconut oil naturally draws out impurities and helps the follicles to regrow your lashes. The lemon oil can also help cleanse the lashes and stimulate more growth while lavender essential oil nourishes your eyelashes and the follicles. Pour some virgin coconut oil into a roller bottle until it is filled around a quarter inch from the top. Add a drop of lavender and lemon essential oil to the bottle. Stir the mixture well and put the lid back on the bottle. Shake and it is ready to us. Apply the serum to your lashes with your roller ball each night before bed. Using the roller ball is more hygienic than using your fingers and prevents contamination. If you get too much of the oil onto your eyes, blot them dry with a cloth. Let the serum work overnight then rinse away any residue in the morning. Use the treatment each night until you achieve the desired result. This is a more basic treatment using coconut oil alone. It is very simple to follow and can be very effective for anyone looking for more beautiful and fuller looking lashes. Dip a cotton swab into your virgin coconut oil. Dab a little of the the oil onto your eyelashes. Massage the oil into your lashes with your finger. Close your eyes to make sure that none of the oil gets into them. Let the oil work for an hour or two then rinse it away with clean water. Repeat the treatment 3 or 4 times a week. Another great home treatment to ensure you get full and beautiful looking lashes is to combine your coconut oil with castor oil. Castor oil is another nutritious oil that can be used alone to treat the lashes but when mixed together with coconut oil, you get the best of both worlds. Give this home treatment a try; we are sure you will be impressed. Take a teaspoon of virgin coconut oil and add 2 or 3 drops of castor oil. 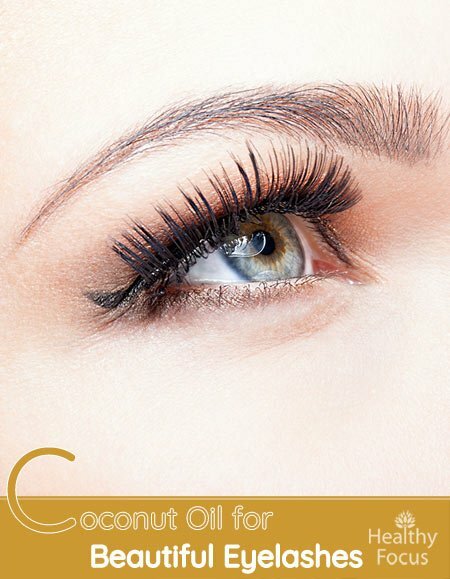 Apply to your eyelashes with a cotton swab making sure you don’t apply too much or let it run into your eyes. Let the oil sit for a few hours before rinsing it away with clean water. Repeat the treatment each day until you have achieved the result you are looking for. Coconut oil is such a versatile and useful substance that it is indeed hard to list all of its benefits. To start, the oil is great for protecting the health of your skin, hair, and even teeth, and these benefits can be experienced without ever consuming the oil. Applying coconut oil to the skin and hair provides similar moisturizing and protective benefits. On the other hand, the oil can also be used as a sort of mouthwash in what is called “oil pulling,” which uses coconut oil to kill harmful bacteria that may be present in the mouth. This process can generally improve the health of your teeth and mouth as well as reduce the presence of bad breath. Many of the benefits provided by coconut oil actually come down to the fact that it is a medium-chain fatty acid, as mentioned before. General research studies have shown that these medium-chain fatty acids can help boost energy since they aren’t processed like other fats and are instead directly burned and converted into energy. Studies have also shown that these fatty acids are beneficial in stimulating the metabolism, preserving sensitivity to insulin, and potentially increasing overall physical performance and endurance over time. Overall, coconuts have simply been proven to contribute to excellent health in those that consume them, even when they make up the majority of a person’s diet. Throughout history, coconuts have actually been a dietary staple of many cultures, even though Western people only know the fruit (or nut or seed) as an exotic and special food. Tokelauans, who live in the South Pacific, used to consume more than 60% of their daily calories from coconuts, and they were all in great health with few cases of heart disease ever being noted. The Kitavans are another great example of this. Is coconut oil good for your eyebrows and eyelashes? Although there is no research to demonstrate that coconut oil works to stimulate eyelash and eyebrow growth, there is plenty of anecdotal evidence that it does the job effectively. Coconut oil is full of valuable nutrients that can stimulate and nourish the follicles and help boost the growth of your lashes and eyebrows. READ Can you Pop a Cyst? Many people use coconut oil on their hair as a treatment to help boost hair growth, strength and health. The fatty acids and vitamins found in coconut oil can help nourish a person’s scalp and also remove the build-up of sebum in the hair follicles. This in turn may encourage hair the growth of fuller and thicker hair. How do you thicken your eyelashes? Apart from coconut oil, there are a number of other potential home treatments to help your eyelashes grow fuller and thicker. Some of these include castor oil, vitamin E, vaseline and lemon peel. Comedogenic ratings are scores that are given to natural substances expected to be applied to the skin as a way to help consumers determine which substances will be the most likely to cause a bad reaction on their skin. The scores are given on a scale of zero to five, with the lowest numbers being given to substances that are the least likely to irritate a person’s skin, clog their pores, or worsen the appearance of skin conditions like acne. With that said, people may still experience skin reactions that are contrary to what the ratings suggest, which is why they are only meant to be taken as words of advice when looking for new skincare products. The comedogenic rating given to coconut oil is actually very surprising, considering the consensus you tend to hear about how effective the substance is. The oil has been given a score of four, which should technically mean that it is very likely to irritate a person’s skin, clog their pores, or worsen acne breakouts. With that said, many people still seem to encounter no problems when using the oil. To be safe, however, you may want to avoid using coconut oil if you have very oily skin or are prone to acne breakouts. Overall, it seems that coconut oil is actually the best option when it comes to a natural lash treatment. If you’re looking for fuller, thicker, more luscious lashes but want to avoid all of the chemical products that you might pick up at the store, coconut oil is a great alternative to consider. As mentioned, however, just make sure to only use coconut oil that is pure, organic, and unrefined to ensure the high-quality product and that your body and eyes will be safe during use. If you do plan on using coconut oil on your lashes, there are a couple of things to keep in mind. It’s best that you treat your lashes with the oil before you go to bed, and you should also make sure to wash your face with soap and water before applying the oil. You’ll only need to use a small amount, so don’t feel the need to go heavy on the coconut oil in hopes of seeing greater or quicker results. You should also avoid using other products while using coconut oil on your lashes, especially fake lashes that involve the use of adhesive.